It is often with reproach that Feminism is received in contemporary conversation—c, a rebuke is made against the (usually false) idea that feminism is an Unterdrücker of men. There are various self-described “meninists” and intellectuals alike who reject the idea of feminism and the pursuits of feminists, often under the aforementioned pretense; even classical feminists (those of the second-wave cloth) often meet contemporary (so-called third-wave) feminism with contention. Certainly there exist those extremes of feminism which do fall under the pretense of Unterdrücker; however, these are, as stated, extremes. Nonetheless, the very volatile environment in which feminism exists today demonstrates the need for critical and dialectical conversation. Especially if feminism wishes to achieve its ends, there must be a social discussion (indeed, such is required to define the exact ends themselves of the movement!) of feminism. Lo! This is the exact stance (or purpose) of Boston University’s “Women’s Ultimate (Lady Pilots)”and their dialectical series of “Why I Need Feminism”, which includes women and men. In the vein of those so-called “meninists” and anti-feminists who seem to have popularized the posting of photos on the internet which display them holding signs which state why they do not need feminism, Boston University’s “Women’s Ultimate” have begun this series by having females and males post photos in which the individual presents a sign explaining why they do need feminism. The ultimate (pardon the pun) goal of this project is, according to the group, to help “people understand the definition of the word and movement of feminism, [which] is: the doctrine advocating social, political, and all other rights of women EQUAL to those of men.” It is, thus, a project dedicated to dispelling the myths of feminist oppression, as well as those extremes of feminism, the Hasserinnen, which often become the embodiment of feminism for those against the movement. This organization, then, represents the necessary feminist dialogue in the pursuit of defending feminism from its often misguided detractors and misguided proponents. But what are the merits of such dialogue? Not only does such a project provide a counter to the “Why I do not need feminism” proclamations, it also demonstrates an intersectionality which is often absent from the extremes of feminism—that is, it presents the ultimate goal of feminism qua itself: the equality of man and of woman. This is a meta-project, then, which demonstrates feminism qua feminism, and feminism in terms of its merits and ideals—a sure way to initiate the very necessary discussion of feminism as a movement. For the first time in history, women make up half the educated labor force and are earning the majority of advanced degrees. It should be the best time ever for women, and yet… it’s not. Storm clouds are gathering, and the worst thing is that most women don’t have a clue what could be coming. In large part this is because the message they’re being fed is that they now have it made. But do they? 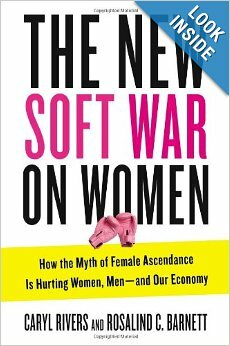 In The New Soft War on Women, respected experts on gender issues and the psychology of women Caryl Rivers and Rosalind C. Barnett argue that an insidious war of subtle biases and barriers is being waged that continues to marginalize women. Although women have made huge strides in recent years, these gains have not translated into money and influence.